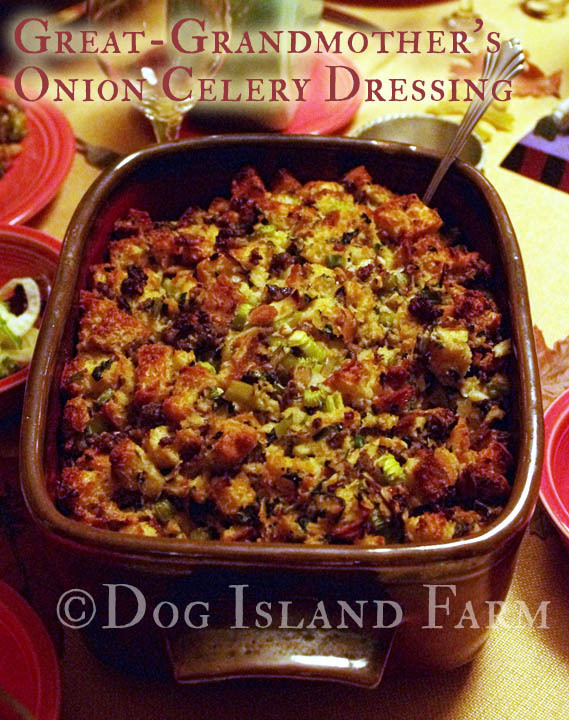 It is time to share one of my favorite Thanksgiving dishes – the Stuffing, or in this case, the Dressing. This is a recipe my mom has made for as long as I can remember, which she got from her grandmother – my great grandmother. My great-grandmother called it her Celery Onion Dressing, but this is so much more than just onions and celery. We don’t stuff the turkey with it, which is why we call it dressing since we serve it on the side. You could stuff a turkey with it, but just remember that it will substantially lengthen the time you have to cook the bird to ensure that it’s all safely cooked through. When I asked my mom for the recipe she told me she didn’t actually have it written down and just made it from memory. In my opinion, these always seem to be the best recipes, especially when my mom is involved because she is seriously one of the best cooks ever. I’m not joking either. She’s never made a bad meal and she can pull out all the leftovers in the fridge and make the best meal you’ve ever eaten in your life. Of course she’ll never be able to repeat it again, but you know the next meal will be just as delicious. Even though she always did this recipe by memory she humored me and wrote it down. 3/4C chopped mushrooms, chopped. Button, crimini, assorted is best add some shitakes if you have them. 1. Cut the loaf of bread into 1/2″-1″ cubes the night before and put in a warm oven (a pilot light is sufficient) until cubes are hard. 2. Don’t chop vegetables too fine or the dressing lacks texture. 3. Saute the sausage first then add the onions, mushrooms, celery and garlic until the onions are translucent and the sausage is cooked. 4. Mix bread cubes with the sautéed sausage and veggies then add melted butter, eggs, salt and pepper, red pepper flakes, curry powder, Thyme, sage, rosemary, parsley, and whatever other spices you might like and fruit and/or nuts if you want. Then add enough chicken broth until the mixture is quite moist but not mushy. 5. Put the stuffing in a casserole covered and bake at 350F for about 45 minutes. ← The Best Freaking Turkey you will EVER taste! I’ve made it 3 times since she gave it to me and it’s just as delicious as I remember! Thank you! I’m thinking we will have this as a ‘stand alone’ main course many times in the future! Paired with a fresh green salad…YUM!